Stirring Trouble Internationally: Money, Money. Where Has All The Money Gone? £300 Billion has been invested into money money money banking, that works out a very large investment. The time has come to get the balloons and start a party investment. 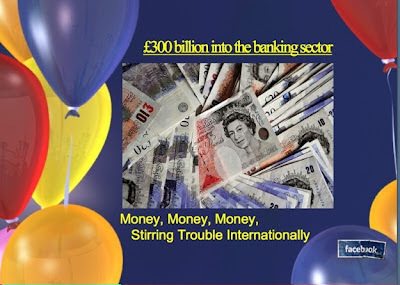 Your money money money is being invested and the transactions from this money money money money is being made by the bankers who have access to this £300 billion. knowing how to spend £300 billion wisely depends on the what the people investing and spending do with this bankers money. £300 Billion is a lot of money money money and requires strategic thinking when investing. There is a lot of interest that can be made on £300 billion. Some of the investments with money are discussed over on Stirring Trouble Internationally. In this post I have included a song by ABBA. Martin McCauley writes from London: Wondering why it is so difficult to get a bank loan? Money, Money, Money. Where Has All The Money Gone?